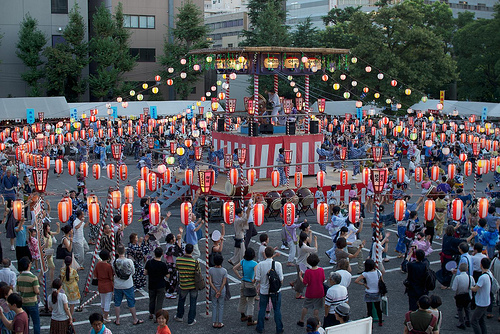 In Japan, a lot of Omatsuri (festivals) are held in summer. Omatsuri means ritual to worship Kami (God) or Hotoke (the Buddha), or an event to appreciate nature, and each festival has meaning like wishing for an abundant crop or appreciation for harvest, etc. As a total in Japan, about 300 thousand festivals are held through a year! 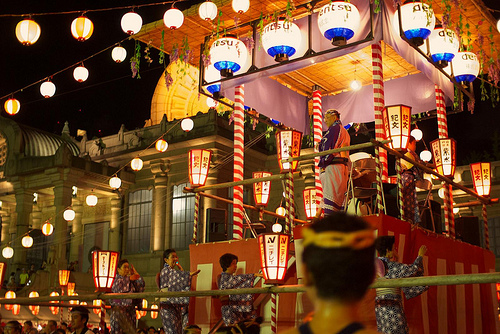 One of Japanese traditional events given in festivals is “bon-odori”(bon dances). In Japan there is a specific period called “o-bon” in summer. It is believed that our deceased ancestors return to us when o-bon comes around and “bon-odori” is held to console the dead. 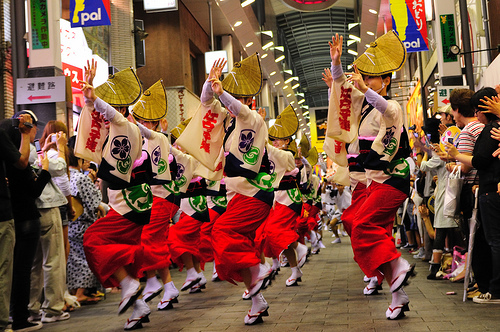 The history of “bon-odori” is very old. It stated more than 500 years ago. A scaffold called “Yagura” is built in the middle of the park, and everyone dances walking around it to the music. Most of Japanese may have experienced it. It would be easy to understand if you saw the picture. The enjoyment in bon-odori is not only dancing. First, the fashion. Generally people dance at bon-odori in yukata. Of course some people dance in their normal clothes, but if you danced in yukata, you would feel better. There are various kinds of yukata, so it’s fun both choosing and looking at it! And not only yukata, but also choosing accessories is enjoyable. Wearing geta(wooden clogs), putting sensu(a Japanese fan) in the obi(a sash), and carrying kinchaku(a purse) in your hand. That’s the kind of fashion we feel the Japanese taste, isn’t it? Second, the music. In bon-odori, the specific music called “Ondo” is used. Different “Ondo” is used in each area and each festival, so listening and comparing every “Ondo” would be fun! Among “bon-odori”, there are so-called “Japanese three big bon-odori”, which are “Awa Odori”(Tokushima), “Gujo Hachiman Bon-odori”(Gifu), “Nishimonai Bon-odori”(Akita). Every year a lot of tourists visit them and crowded so much. Let’s go to Japanese three big bon-odori!